The situation in Donbas is escalating. The situation in the zone of the antiterrorist operation in Donbas is escalating as militants have made 32 shelling attacks on the positions of Ukrainian army over the past day. As a result, one Ukrainian soldier was wounded, the press center of the ATO reported on Facebook on Tuesday, 18 April. The coastal sector remains the hottest spot. The Russia-backed separatists shelled the defenders of Novohryhorivka from 120-mm mortars and IFV weapons. The settlement of Chermalyk was shelled with 82-mm mortars, and heavy machine guns, just like Maryinka. 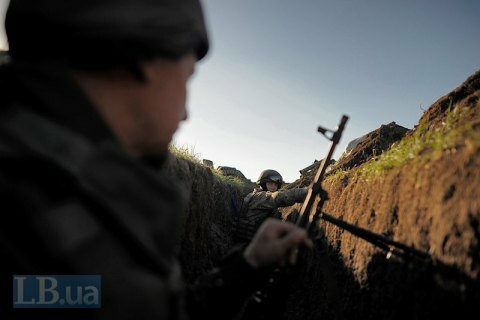 The positions of Ukrainian marines in the area of Vodyane were attacked with the arms of infantry fighting vehicles, anti-tank grenade launchers and heavy machine guns. Shyrokyne, Talakivka and Pavlopol were under the fire of grenade launchers of various systems and small arms. Enemy snipers were active in the area of Talakivka and Vodyane. In the Donetsk sector, militants fired 82-mm mortars, grenade launchers and heavy machine guns at the positions of Ukrainian military in the area of Avdiyivka. Anti-tank grenade launchers, heavy machine guns and small arms pounded Butivka coalmine, as Kamyanka was fired at with meavy machine guns and small arms. In the sector of Luhansk, Russia-backed militants used 82-mm mortars and automatic grenade launchers against ATO troops deployed in the areas of Katerynivka and Novooleksandrivka. April 13 was to mark the start of a comprehensive ceasefire, agreed with the official representatives of the self-proclaimed Donbas "republics" during the negotiations in Minsk on 12 April.